In the first and second part of our three-blog series in ‘Testing’ category, we have already discussed about the changing face of testing, importance of test automation and how Kovair helps organizations successfully complete the journey of their test cycles. In this blog, we will explore why this journey cannot be effective until proper traceability and real-time reports are available to testers and QA leaders. We will also learn how Kovair provides an end-to-end coverage of test artifacts through traceability views and visual representation of real-time test metrics. An effective Test Automation strategy significantly reduces the QA cycle time without compromising on the test coverage and the ultimate quality of a product. But, can the Test Automation alone ensure better quality and enhanced productivity without proper reporting and traceability across artifacts? It certainly cannot. Standalone automation definitely solves the problem of time-consuming and repetitive manual testing effort in any organization. But due to the fact of data residing in different tools, after completion of test automation, it is very difficult to capture the test results and link them to each of the individual test cases. This becomes a challenge for QA managers to trace every test script back to the test requirements and their corresponding test cases. A real-time visual representation of test results gives users a clear visibility into the key test metrics that meet the ultimate objective of test automation. Different quality metrics like test execution status, defect density, and defect injection rate combined together allow users to ensure quality at every stage of development. Traceability is the common thread that ensures quality verification and feature validation processes for a product are complete. 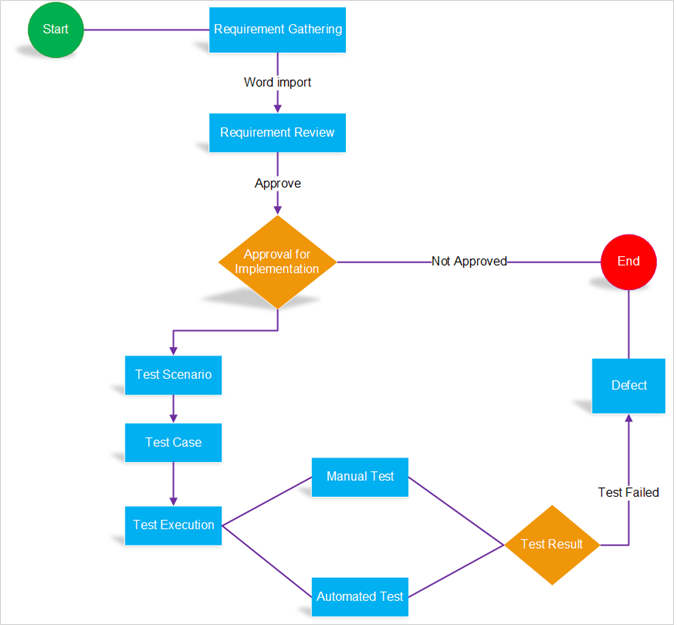 The need for traceability between automated test cases and requirements is no way different from that of manual test cases. In absence of proper traceability, users fail to understand the test coverage against requirements. Traceability not only ensures completeness of test coverage, but also allows users to view the number of defects raised against corresponding requirements. .
A proper end-to-end, bi-directional, and cross-tool data based traceability among various artifacts of a project is necessary to get complete coverage at every step. It also helps in quantitative impact analysis of any change request which enables management to take data-centric decisions on implementation of that change. 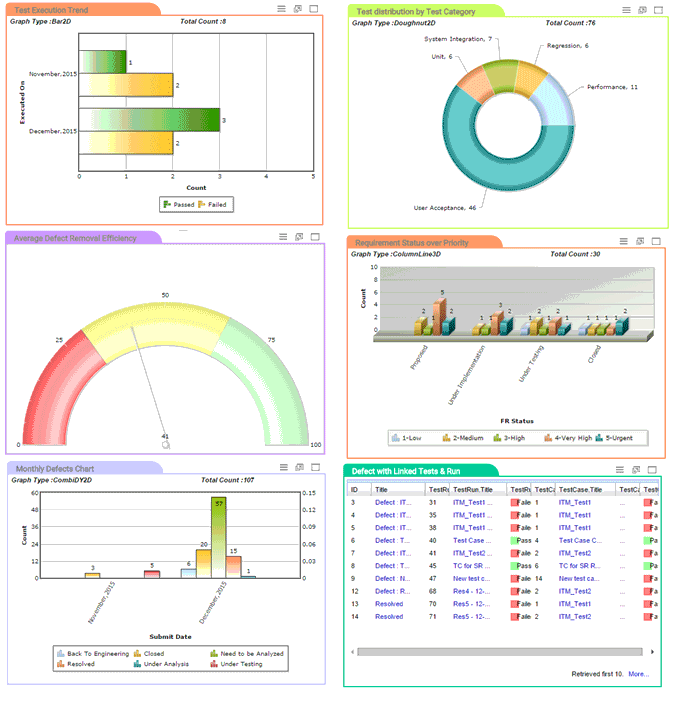 Kovair Integrated Test Management – iTM platform provides a central repository for all stakeholders to remain connected and updated with same information. Kovair Omnibus, capable of integrating with 60+ ALM and IT tools, helps organizations to integrate their people, processes and tools. This enables them to achieve better collaboration among stakeholders and gain real-time cross-tool data based reports, dashboards and traceability. In our previous blog “Importance of Test Automation and How Kovair Supports It”, we discussed how Kovair adds value in test automation and facilitates execution of automation test scripts directly from Kovair application. In the following section, we have explained a use case to showcase how Kovair facilitates the generation of useful test metrics and an end-to-end traceability view based on the data from different tools. Let us assume that in an organization, requirements get created in Kovair iTM and then collaboratively reviewed and approved through Kovair iTM’s Review capabilities. 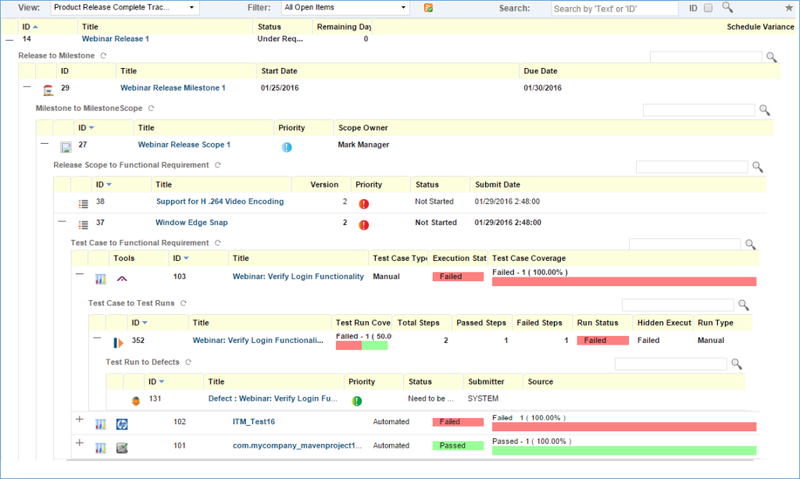 These requirements can also come from any other Requirements Management tools like Jama, IBM DOORS, and HP ALM. Once the requirements are approved, manual test cases get prepared in Kovair iTM. The Test Suite and Automation Test Cases (Methods) get created in Selenium from NetBeans IDE and are added to Kovair through Kovair’s plug-in for Selenium. The Test Suite in Selenium gets added as a Test Suite in Kovair iTM. Each of the methods in Selenium gets added as a Test Case in Kovair iTM and automatically linked to the parent Test Suite. Requirements also get linked to Test Cases from Kovair iTM. Once all tests are executed from Kovair iTM application, the results get linked to the Test Cases for both manual and automated testing. For failed test cases, defects are raised in Kovair iTM or any other defect management tools like JIRA, Bugzilla and then linked to the test cases. In Kovair iTM, this entire flow of events can be controlled through a centralized task based workflow irrespective of the tools involved. Kovair’s automated workflow along with notification feature helps teams to improve both productivity and quality by keeping the testers connected and updated with real-time progress of the development. A sample workflow for the above-mentioned scenario is given below in Fig: 1. On successful completion of this entire workflow, the end-to-end traceability view gets generated in the Kovair application as shown in the Fig: 2 below. For any change request against a requirement, users can do an impact analysis using the traceability feature and then take an objective decision on change implementation. With Kovair iTM, not only the traceability but also various real-time test related metrics can be generated based on the data coming from different tools. These reports and dashboards with drill down capability keep stakeholders informed with the same source of information and ensure quality at every step of development stage. Through this series of three blogs, we learnt how the roles of testers and testing as a whole are changing in today’s world of Agility. Kovair iTM helps organizations to keep up the pace with this change at every step of test cycle. With its strong support for managing and executing test cases along with traceability and real-time data based reports and dashboards, Kovair ensures that quality metrics of a software product are maintained right from ideation to deployment stage. To know more about Kovair iTM, visit this page. Somesh Chandra Roy is the Senior Manager - Delivery, Support and IT at Kovair Software. He has overall 17 years of experience in Software industry, predominantly in Testing, and QA. Somesh heads the Testing division at Kovair and drives several key initiatives like designing integrated testing framework for clients, automating test automation projects and many more. He loves traveling and listening to music at his leisure time. Next Post:Testers Need Serious Help – Are We Listening to Them? Informative post! Thanks for sharing this such a useful information on Importance of Real-Time Reports and Trace-ability in Software Testing it really helpful.Thank you for sharing such information with us. continue sharing! Nice post! Really a nice post is presented by you. In my opinion, this list helps the programmer to understand about the Software testing. I hope to you to present this type of post in the future also. Thanks for sharing the information.